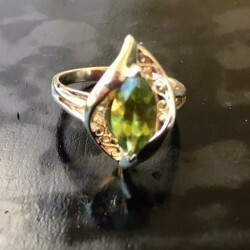 I am selling a truly one of a kind marquise peridot filigree ring in a rich yellow gold. European designer. The peridot measures approximately 12mm x 6mm (1.5 carat diamond equivalent). Wonderful finger coverage - a lovely, unique setting for a marquise diamond or moissanite should you choose to reset. Size 6.5 (resizable). Hallmarked 14k.The maker’s mark I believe reads “I.K." Ring box included. Rarely worn and recently professionally cleaned and polished by a local jeweler. Ring box included. "The beauty of peridot, the gem form of the mineral olivine, is a result of extreme conditions. Peridot is found in the rocks created by volcanoes and even in meteors that fall to earth. A few samples of extraterrestrial peridot have even been faceted into gems. Peridot is formed deep within the earth under tremendous heat and pressure. 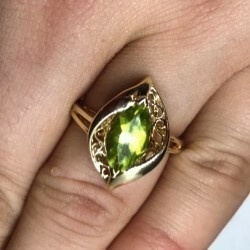 The fresh lime green of peridot is its distinctive signature. It has been found in ruins of ancient Egypt and Greece and was often called the evening emerald by ancient Romans, who noticed that its green color shone even more vividly in lamplight, making it resemble deep green emeralds. Most ancient peridot probably came from the Red Sea island of St. Johns, which produced highly prized dark-green peridot. 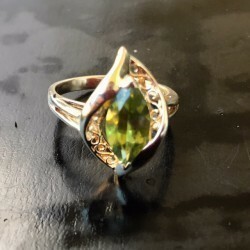 While emeralds are usually the most popular gemstones that come in green, Peridot is considered the “evening emerald” for its olive tinge and more subtle hue. 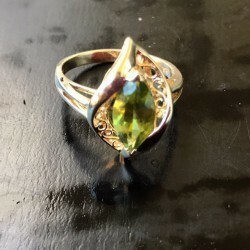 While all types of jewelry can be made from Peridot, because of the stone's softness rings should be worn with care. 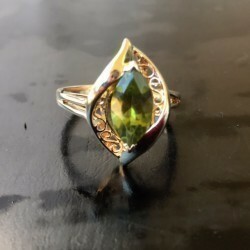 If you are looking for a less known, but extremely beautiful rare green gemstone, you can’t do much better than Peridot." Asking $250. Price is firm. The price includes shipping (with tracking and insurance) within the United States. International buyers, please contact me for a shipping quote. As I am a private seller, please consider this a final sale.